The Shadowman stepped close, looking into Damnation’s eyes until he saw the Irishman recognize and focus on him. Then he nodded. “You were right. You were the one I sought.” The houngan smiled wide, revealing just a hint of blood still on his white teeth. “We depart in the morning,” he said. “Before dawn. “Leave him there until then,” he ordered. Some time later, he woke in a momentary burst of perfect crystalline agony, as if the whole world had frozen solid, and then shattered into splinters – and then each and every one of those needle-sharp shards stabbed into his flesh. He arched his back, groaning, every muscle taut with agony; and then he fainted once more. The English sailor chortled and then threw a second bucket of seawater across the Irishman’s back; unfortunately, the bloody pirate didn’t react the second time. The man shrugged and smeared the strange milky-blue ointment he had been given by the Shadowman and told to use on the pirate’s raw, bleeding back; had he known what was infused into the salve, he might have been more cautious about applying it. Or perhaps he might have kept it for himself. As it was, he would feel the effects later, and would chalk it up, as the men did whenever they were visited by evil visions, to the malevolent spirits that gathered around the Shadowman. They were not far wrong. The sailor finished his ministrations, tying clean strips of cloth over the wounds, and then leaving the unconscious pirate tied to the Scourged Lady, like a bride and groom in Hell, dancing together as the devil’s whips slashed and tore at them, and the blood flowed like wine. The drugs in the salve worked quickly into Damnation’s bloodstream; deadening his pain, they allowed him to fall into a deeper slumber: and then the hallucinogenic compounds flooded his brain and Damnation began to moan and whimper as the nightmares stooped down, caught him in their terrible claws, and swept him away. He dreamed that he stood on a beach, a beach that seemed familiar, though the sea before him was black, and the sky above a turgid, looming maelstrom of red and dark grey, smoke and fire and thunder coursing and writhing above. He stood with both his arms outstretched, and in his hands was his sword, pointed at the sky; the blade gleamed, and the words Sangre-Muerte-Libertad flashed red in the hellish blood-colored light. He looked up from the blade and saw, between him and the black waves crashing onto the gray-brown mottled sand – the foam running in sickly green gouts and swaths across the sand like corruption from a wound – a line of men kneeling one behind the other all the way to the water’s edge. He looked closer and saw that they were his men, the crew of the Grace of Ireland. As he realized it, they stood, moving as one, and marched in a line until the first – his mate and right-hand man, Ian O’Gallows – stood directly before him. Ian’s face was somber, even sad, and Damnation wanted to say something to comfort his friend; wanted to smile, wanted to put down the sword ( surely there was no reason to hold a blade when facing his own crew?) and clap Ian on the shoulder, clasp his arm in friendship, offer him some solace for his suffering. But Damnation could not move, not a muscle, not an inch; he could not open his mouth even to speak, could make no sounds emerge from his throat. But then, without him willing it to happen, his arms moved: the tip of the sword turned down, down, until it pointed straight at the center of Ian’s breast. Then Ian, eyes on Damnation, walked forward, moving steadily. The sword pierced him, and blood flowed; Damnation tried to shout, to drop the blade, to throw the sword from him, but he could only stand still as Ian thrust himself forward, driving the blade deeper into his own chest, deeper, and then through him: and still he came, until his breastbone pressed against the crossguard, and Damnation could feel the hot blood on his petrified fingers. He did not look down, though: he looked only into Ian’s eyes, seeing the sorrow there, the grief, grief that was reflected on Damnation’s heart. Ian’s knees gave, and he sagged down, and though it burned and tore at the muscles of his arms, his shoulders, his back, still Damnation could not lower his arms, could not lower the blade: he held it outstretched, parallel to the ground. Ian’s eyes slowly rolled back in his head, his face going slack: dead. His head fell to the side, his body falling limp, the blood slowing to a trickle, a creep. And then the sharp blade began to cut up through Ian’s flesh, as his weight pulled down, until finally the sword burst free from Ian’s shoulder, the lifeless body collapsing to the sand at Damnation’s feet. Revealing, standing behind him, Damnation’s cousin, Owen McTeigue. And everything repeated, with Owen: sad-eyed, he walked onto Damnation’s blade, bled, died, and slowly fell as the blade worked its way up through his corpse. And was succeeded by Llewellyn Vaughn. And then Kelly Ó Duibhdabhoireann. Shane MacManus. His kinsmen Arthur Gallagher and Michael Rearden. Salty O’Neill. Liam Finlay. Padraig Doyle. Roger Desmond and Robert Sweeney. Abram O’Grady, moving steadily over the sand even on his pegleg. One by one they died, and fell, their bodies tumbling over each other, now pressing up against his legs like a woodpile that had fallen into him. The last was Balthazar Lynch. He was weeping openly, and Damnation could feel tears rolling down his own cheeks. But the sword never wavered: and Lynch, who was a full head shorter than most of his crewmates, was not tall enough for the sword’s point to run through his chest: it slid into his throat, just below his softly rounded chin. His blood sprayed as the sword pierced his neck, sprayed hot across Damnation’s face: and when Lynch died and fell, the sword slewed suddenly sideways, and severed the youth’s head entirely. But the head did not fall. Lynch’s eyes opened. As they did, his body, and the bodies of all of the other dead men, rose to their feet. They stood in a circle around Damnation, and he began to spin, his arms still holding the sword outstretched as he turned rapidly in place – not moving his feet, simply spinning like a top. As he watched, his gaze going form man to man, the men raised their hands, and dug their nails into the wounds in their chests and in Lynch’s neck. They tore their flesh like cloth, like paper, and ripped it away, revealing themselves changed, underneath. They were still themselves, but now every one was aged into his dotage: wrinkled and sagging flesh covered with liver spots, hair white and falling out, teeth gone, yellowed filmy eyes swaddled in plum-colored pouched lids. He spun, and saw them all ancient, decrepit – Lynch’s head now settled back onto his neck, the wound vanished in the sagging jowls drooping from his chin. They stood in a circle around him, and they were beings of light, glorious, exalted. Human shapes gone, frailties and infirmities vanished, they burned and shone like stars. The red-grey turbulence above reeled back, fleeing to the horizon, fleeing the light; and Damnation was blinded by it, so much light he could see nothing at all. He opened his eyes. The light was gone, his men were gone, the beach, the sword, all vanished. He looked about him now and saw only darkness. It was a comfort, now. Then he heard a voice, a familiar voice, speaking words in a dead tongue, speaking at a slow, rhythmic pace. A longing burst into him, a longing so deep, so poignant, that he cried out, wordlessly; he thought the steady chanting paused then, even missed a beat – but then it continued, and perhaps it had not paused at all. Though he could not sense his body, could not tell direction nor sense where he was, he had a feeling of turning around, turning, turning – there. Surrounded by the flickering glow of torchlight, his mother knelt, somewhere before him, though he could not tell how close or far, nor where she was. He longed to reach out to her, to call out to her, to see her eyes as she recognized him, to hear her say his name; but he could not find his own body to move his limbs, his lips, his lungs. He drank in the sight of her: he saw new grey strands in her hair, saw that she wore a dark robe of heavy material that swaddled her completely, saw the lines carved deeper at the sides of her mouth and the corners of her eyes, saw the crease between her brows that came when she was worried or afraid. He listened to her chanting, speaking the language of the druids, and he knew she was seeking him. He could not reach out to her. He could not even find himself to try. Damnation collapsed once more, and fell into another vision. He wakened in pain, his back on fire, arms shaking with cramps; he bit his tongue to keep from crying out, and slowly raised his head and looked around through slitted eyes. Rain washed down his face in streams, and he blinked it away so he could see. He saw the Scourged Lady. He was tied to her, chest to chest, hanging back from arms wrapped around her neck, his wrists bound together behind her, his arms looped through the spaces between her head and her raised arms, her own wrists bound together as his were, but with the wood that comprised her, rather than rope: her bonds were part of her substance. Rain washed down her face and made it seem as though she wept. From the sky above, lightning flashed and thunder rumbled and boomed. With a groan, he pulled himself upright, his arms quivering and aching with the motion, his shoulders nearly crying out with relief as his weight eased off of them. His legs shook as he stood upright – and suddenly his strength fell away like autumn leaves blown from their branches, and he collapsed forward, sagging against the Lady, who held him up, held him almost in an embrace, as if she tried to comfort him. He sighed and leaned into her, his arms clasped about her neck. The storm above eased, the thunder passing into the distance, the rain tapering to a drizzle and then nothing. Then, in the quiet after the storm, he heard a strange sound. It was almost a cracking, a snapping, but it was drier, quieter; not the snapping of a twig, but the crumpling of folded paper. He tried to ignore it: but this was his ship, and he could not ignore it when his senses detected something out of the ordinary; too much of being a captain over a ship was paying attention, was never turning a blind eye to something that looked not quite right – or a deaf ear. It was too ingrained in him to deny, even now, even as he was. He turned his head wearily, opened his eyes to see what it was. It was his beloved Grace: she was falling to pieces. 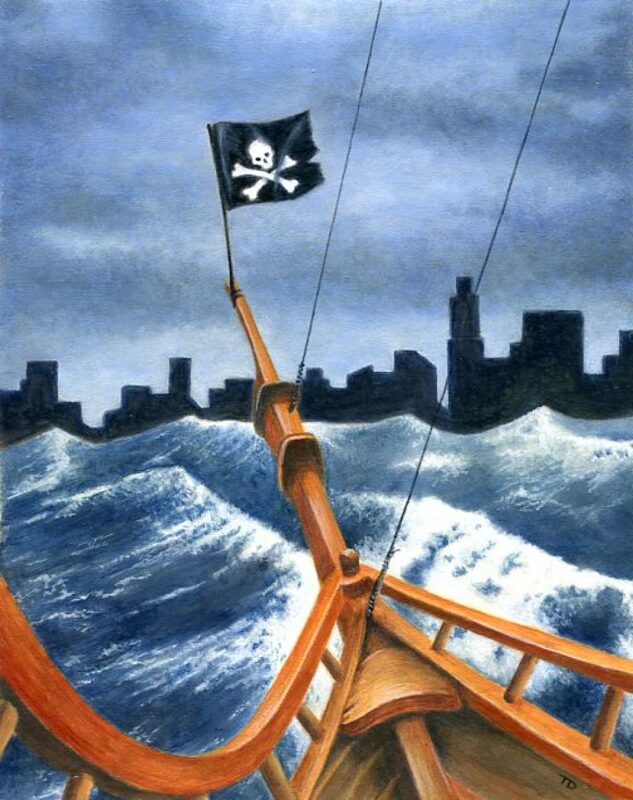 As he watched, the yards fell from the mainmast, making again that crumpling, crumbling sound; the wooden yards fell into splinters as they came down, pattering onto the deck like dry rain. He felt something soft and desiccated brush by his face, his shoulders; he looked up and saw the sails and shrouds of the foremast, rising up directly above him, now falling in flakes and flinders like cold ash, like burned snow. As he looked up, the foremast broke in half with a dry snap!, and then broke again; the segments clattered to the deck, shattering when they hit with a sound like old bones thrown onto a wooden table. The mainmast followed, the shrouds and lines puffing into clouds of dust. He breathed it in, and it coated his throat so that he choked, the ash sticking to his rain-wet skin in dry, itching clumps. His heart leapt into his throat. His ship! His ship was – was dying, was crumbling into ashes and dust! As he watched, the rails cracked and fell away, the poop deck and the cabins beneath fell in on themselves in a cloud of grey particles and fragments of wood. The deck groaned and shuddered under his feet, a crack suddenly splitting across from port to starboard, then running suddenly to stern – and then under his feet – and then he was falling, crashing through the decks which blew apart as he struck them, like dry crusts of bread crushed under a bootheel. But the Scourged Lady remained: solid and heavy, she fell with him, fell below him, and then she hit the water with a splash, he falling across her, his arms around her neck and his hands in the water; all around them, the shell of the ship shivered and whispered as it crackled into dust and fell away. He straddled the wooden Lady, tried to sit upright – tried to reach out to his ship, to call to her, to save her; but he was bound tightly and could not free himself, and could not turn away nor reach out his hand. He lowered his face to the Lady’s, closed his eyes, and wept. He sensed movement. He raised his head and opened his eyes. At first he saw nothing but a cloud all around him, like dark grey fog: it was all that remained of his beauty, of his Grace. A sob shook his throat and made him cough: the expulsion of his breath roiled the cloud, and then he saw what had moved: it was a hand, an arm, reaching out to him, the fingers outspread, stretching towards him. The arm was slender, the hands smaller than a man’s, but seeming strong, nonetheless; and they reached for him, to him: reached to save him. As he looked at that hand, a word flashed into his mind, a word he somehow knew was attached to that arm, to the person behind that reaching hand, the person he could not see. Traitor. Betrayer. He felt a hot anger wash through him, and his eyes and throat burned with the heat of his rage and the dust of his Grace. The traitor’s arm reached out to him, reached to save him. It could not get to him unless he reached out, as well, met the traitor halfway. Damnation turned away from the saving hand. He lay full-length atop the floating figurehead: he embraced the Scourged Lady, finding solace there in pain, in her unchanging solidity, her reliable unliving immobility. The hand drew slowly back, vanishing into the dust. Damnation and the Scourged Lady sank beneath the surface of the water, down into the endless cold depths. The sea poured into him, washing away the heat of his rage, washing away the last clinging remnants of his ship. He was left with – nothing. Cold. Dark. Hobbes. A cool metal pressed against his lips, and Damnation opened his mouth: cool, sweet, fresh water poured slowly into him, and he swallowed again and again, feeling the burning ache in his throat vanish, feeling his limbs and extremities sighing in relief. The water slowed and stopped, and he held the last mouthful for a moment, sluicing it around in his mouth; then he swallowed. With that, his consciousness returned fully, and he was alert. He nodded to Hobbes and said, “Thank you.” Then with a moan and a curse, he stood upright, finding himself as in his dream, tied to the Scourged Lady – but his ship, thankfully, remained whole around and under him. Hobbes offered the metal bottle, and he drank more until the water was gone. Without a word, the Englishman disappeared, as well. As well as he could, though he could not free himself, Damnation turned away from the Scourged Lady. She was not his solace; for him, she held no true comfort. He saw a slight movement behind her, and he stretched out his hand and caught – a rope. A length of two-inch rope, sticky with tar, swinging free at one end since the ship was at anchor, but attached to the foremast above. He held that rope with both hands, his face turned away from the statue to which he was bound; and, softly, he sang a song to his ship. A love song. But am I still captain? I am not on my ship. Where is my ship? Am I even myself? I have slept long and dreamt – strangely. How long? How strange! I dreamt that I was home, in my mother’s house. I awoke in her bower, the carved oak bench she was wont to recline on, the which I would steal for slumber whenever opportunity arose. And the dawn sun shone through the flowers that grew there, up trellises and down walls so that within the bower, all seemed a fairyland, without hint of human corruption in the sweet breath of nature. The perfume of the flowers drifted to me, and the birds gently chirruped, weet, weet, weet. My mother came to me, moving slow as the tides, the sun shining on her face, her golden hair. She wore a gown of blue, and with gold shining at her wrists and her pale throat, she seemed the very sky itself, the heavens come down to bless me and ease away my cares. “Are you home?” she asked with a warm smile. “Aye, mother, I have returned to thee,” I said. I tried to arise, but – could not. “Are you home?” she said again, and her smile faded. The bright dawn did as well, and a shadow crept into the bower. Again I tried to rise, but could not. Something held me to the bench, flat on my back. Helpless. Then my mother raised her hands from her sides, and I saw she held an athame, the druid’s dagger, the weapon used for rituals. For sacrifices. “Are you home?” she hissed, and now her lovely face twisted with anger. Of a sudden her slow, tranquil movements flowed as quick as thought. And my mother stabbed me, and stabbed again. Behind her, in the leaves and vines and blooms, the birds chirruped on. I dreamt I walked a road in the night, the moon bright above and a thousand thousand stars that danced musingly across the sky. From a thicket nearby came the slow sound of an owl hoo-hoo-hoo in the darkness. And as I walked, I felt a hand slip into mine, a hand soft and cool. I turned to look, and beheld – Genevra. My Genevra, alive again, in the perfect blossom of youth and health, as she had been once, but was not, that last time I looked on her. She smiled at me and said, “Hello, my darling devil. Give us a kiss, and then dash us away to your fiery pit.” ‘Twas such she ever said to me. I caught her up in my arms, laughing with her, her voice ringing like bells, like bird’s song, and I kissed her, aye, I did. And as I drew back, her face looked as it had when last I looked on her: pallid and drawn, her eyes shrunk into her skull, her sweet lips drawn back from her teeth by the pain, her soft white throat swelled up like a frog’s by the buboes, her flesh blackened by that bloody English plague. They brought it to us after their city burned (When God wreaked his vengeance on them, aye, did he.) and they took my Genevra from me, and drove me thus to a life at sea. That dying, agonized face looked back at me from my embrace, and now her grimace seemed a smile, and she licked her lips with blackened tongue and said, “Welcome to Hell, my devil, my Damnation. And she laughed like bells. I dreamt I stood on the deck of my ship, my Grace, and the wind filled the sails and carried us over the waves. From somewhere far off, gulls cried, their harsh voices softened by distance into a gentle, regular note, repeating every second or two, Ha! Ha! Ha! As always, I looked to the sails, the lines, the coursing of the sea: all was as it should be, and I smiled as my heart swelled with joy, to be where I was. Where I belonged. “Steady as she goes, Captain?” called a voice, and I turned to see my friend and shipmate Balthazar Lynch at the wheel. Gladly I climbed to the poop deck to stand beside him, clapped him on the shoulder and said, “Aye, we sail fine and true, and naught is ill in all this wide world.” The boy smiled at that, and I noticed the gleam of his white teeth, hale and straight and true, and the blush of health in his smooth cheeks – still too young to shave? – and the sparkle of his green eyes. He’ll reap through the lasses like a very scythe, I thought, as I have many times before, they’ll fall before him and aye, beneath him, too. Then I noted a tear, bright and full, trickling down from the corner of his wide eye. “Why weepest thou, my lad?” I asked him. He smiled bravely, though his eyes were full of suffering. “Because it hurts, Captain.” He looked down, and I followed his gaze to where a blade was sunk deep into his chest, and on the hilt were curled my own fingers. Blood burst forth from the wound then, hot and wet on my hand. I tried to release the dagger, but could not. I looked into Lynch’s eyes once more, and I tried to speak, but my tongue cleaved to my teeth, and my lips would not open. “Please stop killing me, Nate. Please stop killing me.” And his face became Genevra’s face, and then my mother’s, and still the blade in my hand, in her heart, ran red with blood, and I could not let go. I dreamt that I sat in a tavern, in a dark corner by the fire. I looked around the room – ’twas a fine place, a proper Irish pub, with smoking torches in sconces and warm smells thickening the air, though a cool breeze from the open door cut through the room and freshened a man’s breath. In the corner, on a raised platform, three musicians stood, tuning their instruments, fiddle and flute and drum, and the fiddle and the flute played a single note back and forth, back and forth, while the drummer tapped gently at the skin, a slow beat like a heart’s. I looked to the bar, and behind it stood a man I knew, though he was dressed as an innkeeper, in an apron and shirtsleeves stained with food and ale: ’twas Sean O’Flaherty, my Quartermaster that was. At the bar sat Edmund Burke, who raised his mug to me, and I saw a long chain dangling from his wrist, and blood dripping down its length. Beside him was Donal Carter, sawing at a hunk of meat with a great, curved blade, and Elliott Shluxer, who had a barmaid pinned against the bar, hemmed in by his arms, though she laughed and tickled his cheeks. She glanced back over her shoulder, and I saw ’twas the Enchantress. She winked at me most saucily. And on top of the bar, laid out like a roast goose at Christmas, was my cousin, Hugh Moran. And all of them sliced and tore at Hugh’s flesh, thrusting dripping chunks into their gaping, bloody mouths, and laughing as they swallowed. Hugh struggled, and tried to scream, but he had an apple in his mouth, and O’Flaherty held him down. Hugh looked at me, his eyes pleading. The voice, mellifluous of tone and refined of accent, came from my table companion: Captain Nicholas Hobbes of the Sea-Cat, known as the Devil’s Lash. He sat in deep shadow, though I could make out the outline of his thin features, and the shine of his white teeth, the gleam of his eyes. He smoked a pipe, the white plumes curling idly between us. “Then perhaps a draught, to quench thy thirst?” From the shadows that enwrapped his side of the table, he pushed a goblet brimming with a red fluid. Wine? Blood? I demurred once more. “I do not thirst,” I spake, but I lied – my throat was a fire, my voice cracking like a pine log on the hearth. I strained my eyes, peering through the smoke and darkness, and I saw that there was not only one smile, or one man’s eyes agleam in the dimness, but two: behind Hobbes lurked another, lost in the shadows but for the white of his smile and his gaze, the which gleamed hungrily. “Then mayhap this is what you seek,” Hobbes said and across the table he thrust a pistola. As he leaned forward, he came into the light, and I saw that his face bore the waxy yellow pallor of the dead, and around his throat I saw two hands wrapped tight and squeezing, the fingers dark and scarred. “Aye, I thank thee kindly, sir,” I heard myself saying. And I took up the pistol from the tabletop, pressed the barrel against my head, and pulled the trigger. I am thankful that I have never been press-ganged. I’ve known men who have, and I have spoken with them about the experience. Some were pressed into a better life than that they left, for all that it was the British navy they now must needs serve; still, a British seaman gets food and clothing, a berth and companions, and if he serve loyally, mayhap even the gratitude of the Crown. And some, of course, were stolen away from happiness, from hearth and home, companions and kin, to be flogged like brutes and treated like beasts. These latter had escaped, while the former were generally released from service after some years before the mast. But for all, that first waking was a memory that haunted. That first moment of awareness, when the last thing you recalled was a walk through dark streets, or perhaps a drink of ale or wine in a tavern by the docks, and now you find yourself with aching head in a hammock, or sprawled across the rough planks of a deck, on a ship at sea, moving with the waves when last you stood on solid land; in your nose the smells of salt air and a ship and men, and in your ears the sounds of wind and waves, sails and shrouds, and chanteys and shouted orders to rise and work – perhaps punctuated with a kick, or a blow from a belaying pin or marlinspike: every man to whom I spoke of it said that the confusion, the bewilderment of such a change, from landsman’s life to the world of a ship at sea, all of the world altered in the single closing and opening of an eye, had filled them with a terror and a despair that none had otherwise known. Their lives had gone, and they had no memory of the going. The sensation did not last long, but those moments were sheer and absolute Hell. And now I know what they meant. I am in a room with white walls, without window, with one door. I am in a bed, clothed but in a thin wrap like a robe made of parchment or threadbare linen. My arms are tied by leather thongs lined with some soft material, bound to the rails that run on both sides of this bed, and thin tubes are – attached to me, somehow. The tubes lead to a contraption of metal and white-lacquered stuff, with clear sacs like wineskins made of glass, filled with variously colored fluids. The thing chirps like a bird, though more regular-like. My left forearm is well-bandaged, as is my right shoulder, and both pain me severely. My head seems awash in porridge: somewhat thick and warm and impossible to grip are my thoughts. I have slept and woke and slept again, sometimes dreaming, sometimes aware, even as I have written this. I write these words on a bound sheaf of paper which rests on my hip, with a pen I found alongside the sheaf when I woke. I do not know where I am. I do not know the fate of my ship, or my men, or even myself. I do not know how much time has passed, or what has befallen us since – I do recall the battle, though I know not how it has ended. Aye, this confusion is terrible, in truth. I am adrift, and alone. It would, like those press-ganged men I have known, be the worst sensation I have ever felt in this life; except for that I have felt it before. When my ship sailed through time, stranding my crew and I three centuries lost from home. Has it happened again? I do not know. Sleep pulls me down. I fear my dreams. Gods and saints preserve me.